One reasons is expensive bandwidth, this has always been an issue in Mexico, bandwidth is very expensive, while a basic T1 connection in the U.S can run as low as 100.00 U.S.D per month a Fractional E1 equivalent in Mexico can cost around $13000.00 pesos a month, it is pretty hard to handle a lot of services on a one meg connection, while we do have over 20 megs of bandwidth running in to our office, 95% of that is used solely for the purpose of providing fixed wireless internet service to our clients. Power issues can also be a problem, while we do have a back up generator system, that is the least of the problem, another issue in Mexico is the cost of power. At one point we had 6 Dell Power edge servers and we were paying around $14000.00 pesos per month for electricity. 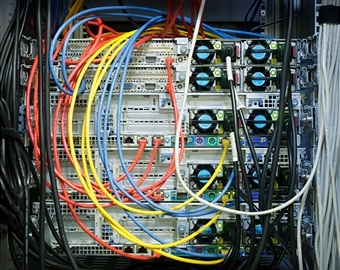 Over a period of time we were able to consolidate those servers leaving only two units, reducing our power costs 60%. If you are looking for a good hosting provider, my recommendation would be Hostgator I have been using them for over 8 years now and currently have over 40 domains spread across different hostgator packages, including their shared hosting which runs around $3.96 per month if paid for in advance. I also have a secondary mail server on one of Hostgators VPS packages which runs me 40.00 U.S.D per month. Hostgator offers me a huge advantage, one because I have all the tools at my fingertips, I can configure off site back ups, and the few times I have experienced issues there tech support team has been very helpful and able to fix the issue quickly. The bottom line is what are you going to do and how many web pages or domains are you planing to host. A small website hosted on Hostgator can easily handle 50 to 100 pages and several e-mail accounts, including easy installation of software packages such as wordpress, joomla and site statistics. If you are looking at hosting a larger website with hundreds or even thousands of pages and e-mail accounts, you may want to consider looking in to their VPS hosting which is essentially your own dedicated server. Hostgators VPS servers come with your own control panel, allowing you to operate all the sever functions just as if you had it in your own home or office. So you still want to host your website in Mexico, you still can, but we will leave that up to you, a simple search in Google will give you some results, I personally have never used a hosting service in Mexico, mainly because I know they are more expensive and realistically knowing the business, I would not have high expectations of fast response times and I know for a fact bandwidth would be very limited.